Saturday we went early to the New School's Brewing Up Cocktails event at the Hop & Vine, and when the crowd overcame us we headed back east on Killingsworth to get some Ethiopian food at E'Njoni. 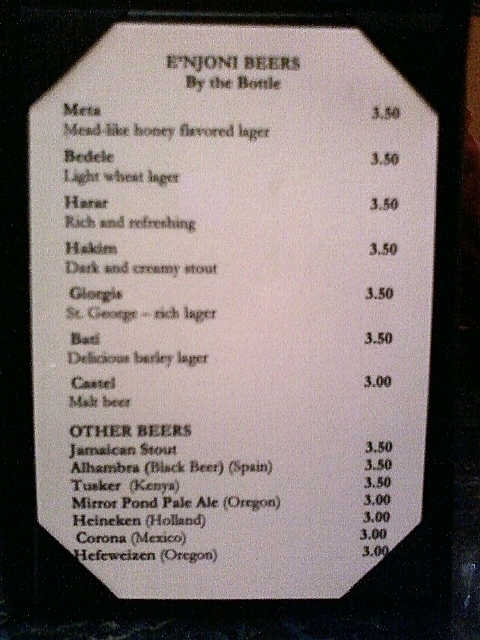 Their menu included a surprisingly broad selection of Ethiopian bottled beers, plus a couple of other international beers that I don't recall seeing elsewhere in Portland. I'm not suggesting these are excellent beverages that you should run out and try, but a couple of them startled me into such nostalgia that I wanted to point out where to find them. The beer I had to order right away was Castel. Twenty years ago when I was in the Peace Corps in the West African country of Mali, the only bottled beer produced there was sold under the Castel label. 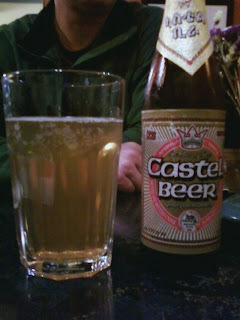 Castel is a French company that licenses their brand and perhaps their recipes to breweries in developing countries. We drank the Castel in Mali only out of necessity: we called it "Casse-Tête", which actually means "jigsaw puzzle" in French, but the literal translation of "head-breaker" described the quality pretty aptly. If you were lucky enough to get it in a 66 cl brown bottle, it might be a little better than the more common green bottles, and the rumor was that it contained formaldehyde as a preservative, though I doubt that was true. The Ethiopian Castel was better than my recollection of what I experienced decades ago, though it was still not very good. Seemed lighter than I recall. It gets a C on Beer Advocate, though of the five reviewers, the only B- is from a guy who thought it would make a "tastey (sic) binge beer". A little more recent nostalgia hit me when I noticed "Jamaican Stout" was also on the E'Njoni menu. "Oh, you have Dragon Stout?" I asked. "No, it's just called Jamaican Stout." Turns out to be from Big City Brewing in Kingston. Last year when we were in Jamaica, I never saw anything local except Red Stripe, Dragon Stout, and locally-brewed Guinness, so I was surprised to see it here in Portland. It was a too-sweet stout along the lines of Dragon Stout, though it was a little better than Dragon: not as sweet, with a little fuller flavor. The Beer Advocates give it a B. It was the best beer we had at E'Njoni. The food's good too -- the usual Ethiopian vegetables and stews served on tangy flatbread. Even though the Ethiopian beers are not likely to bowl you over, it's interesting to see such a broad assortment, and I appreciated the chance to order a Castel with my meal. I'm not sure if Jarra's on Hawthorne or the attached Langano Lounge has any Ethiopian beer, though they usually have a decent Deschutes and something from Spaten on tap. Labels: africa, code-switching puns, food, jamaica, where do I find...? Brian: I was eye-balling a lot of stuff in your basement. Forgot about the Hakim -- where'd you come across that one? It wasn't very good, though it was better than the Castel and St. George's. The food's good at E'Njoni, though. Definitely check it out. Cheap desserts, too. Found the Hakim at By the Bottle on my first visit there (over 3 years ago)... have never seen it there at any other time. I reread my review on BA (gave a C+/3.25) - yeah it was alright, but I'd like to try it again.